Congratulations to Chelsea Jones, Registered Nurse, Acute Demand 24 Hour Surgery. Chelsea has completed the Registered Nurse Prescribing pathway. Once she is formally endorsed by the Nursing Council, Chelsea will be authorised to prescribe specific medications for patients (with medical support for the first 12 months). 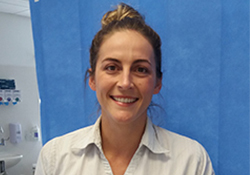 Chelsea is the second Designated Prescriber – Registered Nurse within the Pegasus network and the first at the 24 Hour Surgery. The idea behind this new authority is to provide more convenience for patients and advance nursing practice.